JACKSON, Miss. (WJTV) – A group of young entrepreneurs and Jackson natives teamed up to give back to the homeless community. 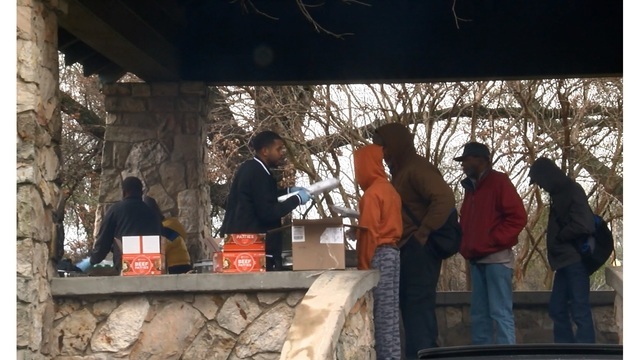 They served lunch to dozens of people at Poindexter Park on Friday morning. Dwight Barnes of Keller Williams Realty, LaDarion Ammons of Brothers of Mississippi Mentoring Group, and Ledarrin Collins of Collins Catering are all graduates of Jim Hill High School. “We grew up in this area, and it’s something that has always been a dream. We were just talking about it the other day, me and LaDarion here, about how we always said we would give back. And so it’s something we wanted to do to keep the tradition going and the holiday spirit,” Barnes said. This is the first time the under 30-year-olds put this type of community service project together, and they plan to do it again.